The Find: A Terrific Tabletop! I've shared this photo before, since it is truly one of my favorites from The Find: The Housing Works Book of Decorating With Thrift Shop Treasures, Flea Market Objects, and Vintage Details. Shot by Jim Franco, this image illustrates a vintage tailgate party thrown by the uber-talented Michael Quinn and Heather Kerr. Note their attention to every detail and their liberal use of items easily found at garage sales and thrift stores. 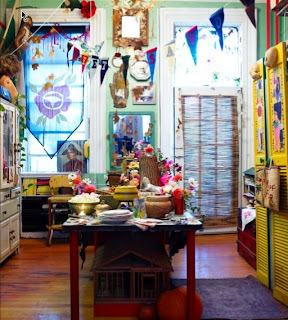 I am attracted to the sunny yellow doors at the right topped off with doll heads -- and then what could have possibly been those dolls' former home tucked beneath a table made out of an old door and propped on a frame. The best thing about this fanciful extravaganza is that Heather and Michael used pretty much what they had, from the mix-and-match plates to a colorful assortment of serving goods. And what they didn't own, they borrowed from family and friends to create a welcoming and familiar environment chocked full down-home charm. For more heartfelt charm, be sure to visit Sonya over at Dime Store Thrift who's offering a personalized copy of my book! Tell her The Elegant Thrifter sent you! The other day when I visited New York's Museum of Modern Art to view Counter Space: Design and the Modern Kitchen with the fantastic Nova Scotian interior designer Jonathan Legate, we found that even though we grew up thousands of miles away from each other, our family eating routines were extremely familiar! We recognized many of the same brands, shared a spirited chat over our likes and dislikes of canned foods and revisited our respective families' dining habits when traveling. (One meal out a day!) 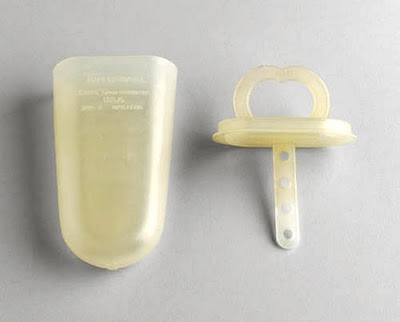 So when Jonathan spied these Tupperware Ice-Tups on a shelf in the middle of the exhibit, they brought back memories to us both. My mom had a special recipe that consisted of mixing Kool-Aid with the same flavor of Jello for a frozen treat that retained its flavor longer. (Back then, Kool-Aid was almost considered a healthy alternative to sodas because Moms could control the amount of sugar they put in it!) But Jonathan's mum used neither: she simply used wholesome apple juice. As we strolled these kitchens of years past, I got to thinking about the old Crock Pots that when I was a kid were the peak of innovation, the Mr. Coffees, which then were considered gourmet brewing machines, and the culture-changing microwave oven. Both Jonathan and I prefer to live without one of these flash cookers, even though each of our moms uses them quite regularly. I gave mine away because it gobbles up too much counter space, and I really don't mind the extra minutes it takes me to warm something up on top of the stove or inside the oven. Be sure to go visit Sonya at Dime Store Thrift who's offering a giveaway of my book The Find: The Housing Works Book of Decorating With Thrift Shop Treasures, Flea Market Objects, and Vintage Details. If you win, I'll personalize it just for you, or a loved one, or even someone you might not like so much! Found Fridays: What's Inside My Prada Bag? If you're like I am, you always want to see what's inside a luxury label's shopping bag, especially this one found in my compactor room. Want to take a peek? 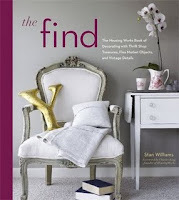 And while we're speaking of free, head over to Dime Store Thrift where Sonya is giving away a personalized copy of The Find: The Housing Works Book of Decorating With Thrift Shop Decorating, Flea Market Objects, and Vintage Details. I know it's not even Thanksgiving yet, but if you're making your gifts and decorations like I am this year, the prep time is upon us! And I'm on the lookout for bright holiday ideas that won't break the bank. Just feast your eyes on these shimmery, sparkly wreaths made from old Christmas ornaments by the super-talented thrifter Sonya Collett of Dime Store Thrift. Sonya started making her holiday wonders last year as a blizzard was making its way toward her home in Sioux City, Iowa. "I always seem to start projects at inopportune times," she says. "But once I started making one I couldn't stop, and the entire dining room table was covered in wreaths, tinsel, hot glue sticks and old Shiny Brites." Sonya tapped into her passion for thrift shopping and combined it with her love of purchasing old ornaments all year long. "I love any old Christmas decorations and get giddy when I find nativities, plastic Christmas junk from the '70s, old strands of lights .... ALL makes me pretty giddy!" 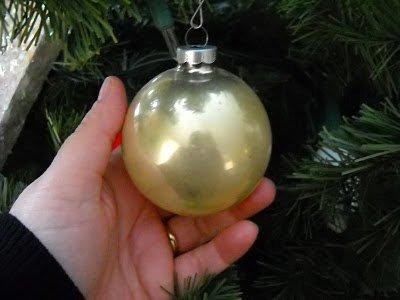 As she hits her local Goodwill (her favorite shopping haunt) she always keeps her eye open for vintage Pyramid and Shiny Brite ornaments as well as goods that were made in West Germany or the United States. "Any color, any size, just let it be old," she says. "And you know, I love the ornaments that you can tell have been used, hung on the tree year after year using an old string or twist tie. I want the ones I find to have been loved. So if there is etching in there, bring it on. But I will not shun a box of never-used Shiny Brites!" 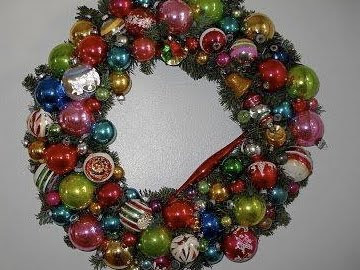 You, too, can make a wreath of holiday ornaments by following Sonya's easy tips. • For your base, use an evergreen wreath or wrap a twig or foam wreath in a long strand of tinsel garland using a twisted piece of sturdy wire that will end up at the top to use as a hook. • Arrange and spread out the ornaments you want to use. Sonya keeps hers sorted by color in wire baskets so that she can see what she has available. 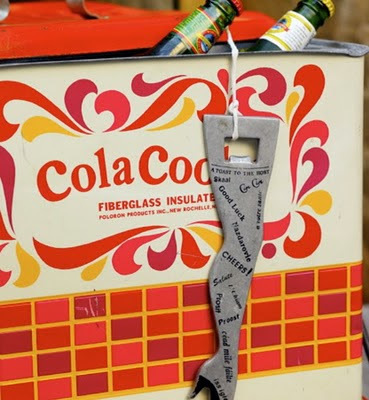 • "Heat up that high-heat hot glue gun, baby!" she says. "And keep a LOT of extra glue sticks at the ready; you do not want to run out in the middle of this project." 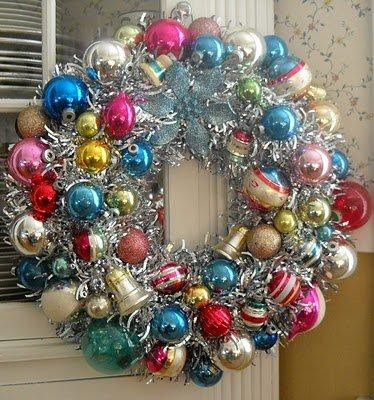 • Locate your most spectacular ornament and affix it to the top of the wreath by squeezing a generous amount of glue onto its backside. Press into place and hold for about 20 seconds. ("It will sort of melt the tinsel as it affixes; don't let that scare you. But please, be careful to not get burned by the glue!!" she warns. "I can't EVEN begin to tell you how bad that hurts." • Then add the rest of your ornaments, using odd sizes to fill gaps and create visual texture, and soon, your one-of-a-kind wreath will be ready to hang. Now doesn't that just put you in the spirit of the season? If that's not enough, be sure to stop in frequently to visit Sonya at Dime Store Thrift as I've heard she's gearing up to do a special giveaway of my book The Find: The Housing Works Book of Decorating With Thrift Shop Treasures, Flea Market Objects, and Vintage Details. What's more, if you're the winner, I'll even sign it for you! I did not - I repeat did not -- purchase this lamp at the Alemany Flea Market in San Francisco, but it was so delightful in its own way that I had to have a photo of it. I'm sharing this brass-trumpet-turned-lamp with you today because, you know, sometimes it's important to blow your own horn and be proud of your accomplishments. So da-da-da-da-da! Here's to us all! Last year while thrifting in Fort Lauderdale at the Faith Farm Thrift Store, I saw a desk that reminded me of the one that I've shared with you in my author photo that appears in The Find: The Housing Works Book of Decorating With Thrift Shop Treasures, Flea Market Objects, and Vintage Details. I'll show it again since after shaving the 'stache I now look like I did when I perched on the desk from my college thrifting years for the photo taken by Bob Greenspan in my sister's back yard. 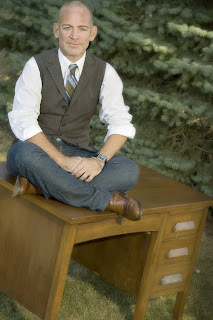 The desk I'm sitting on was found in the early 1980s for $10 at a Goodwill in Independence, Mo. I used it when I was in journalism school and wrote many term papers banged out on my dad's old Smith Corona manual typewriter. It had dings and scratches abound, but my dad lovingly refinished it and it now lives in my sister's home office. The desk I spied in Fort Lauderdale reminded me of the one in Independence, even though it is twice the size of the one my dad restored. I fantasized about purchasing it for the $19 asking price, but if I had, not only would I have had to ship it, but in my Manhattan apartment it would have had to serve as a work space a dining table, a dresser, a craft table and a credenza! Among my favorite finds at flea markets, garage sales and thrift stores are vintage tablecloths and colorful cloth napkins. Like these eye-catching examples I found at The Vintage Laundress's booth at the Texas Antique Weekend last year. I always keep a vintage tablecloth on my dining room table, and I use cloth napkins every day, even though I only iron them when guests are on their way. Last weekend I went out thrifting with a $24 budget, on the hunt for items that I can use for holiday offerings -- namely unique plates, bowls and platters that I plan to offer as The Gift of Thrift. Not only did I come home with $10 still in my pocket, but I also nabbed a made-in-USA Pfaltzgraff platter, a Haeger dish, a mosaic bowl, and this made-in-England-for-Hallmark tin. My plan is to fill it with baked goods and serve it up as a present. Why, it's already gift wrapped, so all it needs to finish it off is a cheery red ribbon. I'll admit it. I have a thing for vintage handbags. But don't ever expect to see me carrying one. Instead, I carefully select these by-gone beauties at thrift stores and garage sales and transform them into gifts that I call Hooch Bags, pretty purses filled with funny money, candy cigarettes and a discrete nip -- a little naughty, but a whole lot nice. They make great hostess gifts and are a hit at wedding parties or other special gatherings. Here's another fun use for vintage handbags: use them as place cards that guests can take home as a parting gift. I saw this idea at the Los Angeles County Fair's tabletop competition. This display was themed, "Ladies Luncheon for Four Femmes Fatales of Film Noir. " Talk about giving a whole lot of personality to bunch of old bags! Frugal Fun: Go Bake a Cake! I'm thinking of making this cake again for Thanksgiving. I found the recipe last year in Southern Living, and it's super easy to make. While the instructions call for using mini-cakes pans I baked my cake a larger pan and it turned out well. See! If you do try out this cake, remember to add the easy garnishes that are suggested in the recipe. Oh, and be certain to serve it on a coordinating, vintage plate! With the holidays nearing, I have lots of tabletop items on my thrifty gift list. And since I am on the hunt for interesting plates, bowls and platters that I plan on heaping with home-baked cookies, cakes and candy, I plan on referring to some shopping tips I offered in The Find: The Housing Works book of Decorating With Thrift Shop Treasures, Flea Market Objects, and Vintage Details. • Keep the the personality of the receiver of your gift in mind. If you know the person you're thinking of puts everything in the dishwasher or microwave, then avoid selecting delicate pieces that need special care. • Buy only pristine goods free of chips and cracks. Hold a perspective piece of china up to the light to inspect for any dark veins or cracks under the finish that will only get worse with use. • Run your finger around the edges and across the surface of you find for any signs of unevenness that could eventually affect the piece's end use. • Look for sought-after markings. You may not be able to afford an entire set of Limoges china or Baccarat crystal, but a single piece can make your thrifty offering even more special. • Keep your eyes open for colorful tins that practically do the gift wrapping for you! • Think beyond intended uses. Fill a bright bowl with beauty goods and a gift certificate, pack a fun martini glass with holiday candies, fill a clear column candle holder with an array of colorful soaps, or use a Pyrex casserole to carry a mini collection of vintage cookbooks. The ideas are endless. • This might go without saying, but once you get your treasures home, clean them until they're spotless. 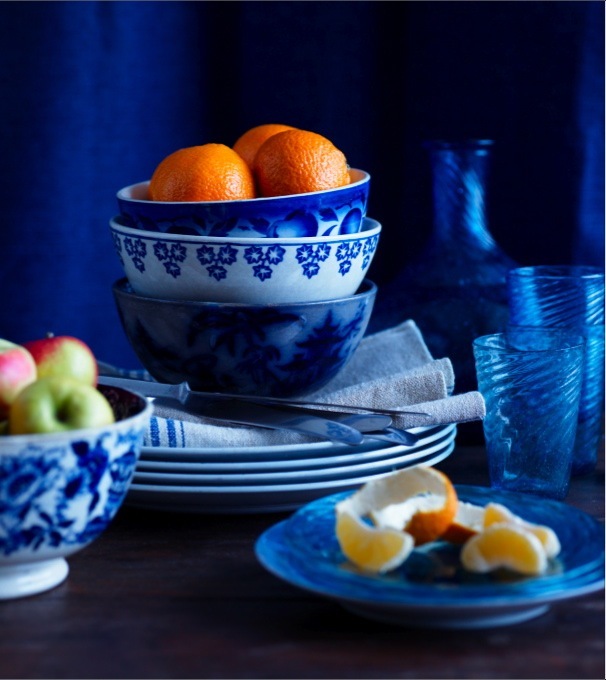 For fine porcelains, rare ceramics and delicate crystal, always clean with mild dish soap. But for the more hearty wares, just pile them into the dishwasher! • Finally, always remember to top it off with a ribbon or bow. Taking the extra time and care to add that final touch to your gift always results in a finished look. Sometimes the most cherished memories are evoked by objects of small monetary value but rich in the sentiments they hold. Like me, my sister enjoys thrift shopping and was on a mission to find a version of a once-common souvenir plate that she remembers hanging in my Grandma Churchill's bedroom -- one that my mother remembers gluing back together when it once shattered to bits. So any time she found her self looking at odd dishes at garage sales or perusing the knickknacks of an estate sale, she always kept that special plate on her wish list. Just last week her efforts payed off when she stopped in on a sale from my childhood neighborhood and upon entering immediately spotted the plate, for which she paid $2. While not a rare antique find of of high pedigree, this treasured plate with its simple, heartfelt message rings true to my sister: "Today is the first day of the rest of your life." As the holidays approach, I've decided that both for my cards and for the majority of my gifts, I'm going to make my best efforts to use as much of what I already have on hand and supplement everything with a smattering of thrifted treasures. Of course, I'll save lots of money, but it's also a lot more fun for me to dream up individual gifts and yes, I do love a project! For inspiration, I grabbed the 1970's Farm Journal Christmas Book that my sister gave me last Christmas and 1985's McCall's Cookie Collection that I found lying on the street in Carroll Gardens, Brooklyn. When I started rummaging through my drawers in search of something to mark my favorite pages, I discovered a little sign that I might be on the right mission: the cheery, tree-shaped Post-It Notes that you can see attached to the pages above. While I'm still in my planning stages, I can assure that these guys will make an appearance somewhere, and of course, there will be lots of glitter! Lots! Don't just recycle your old newspapers! 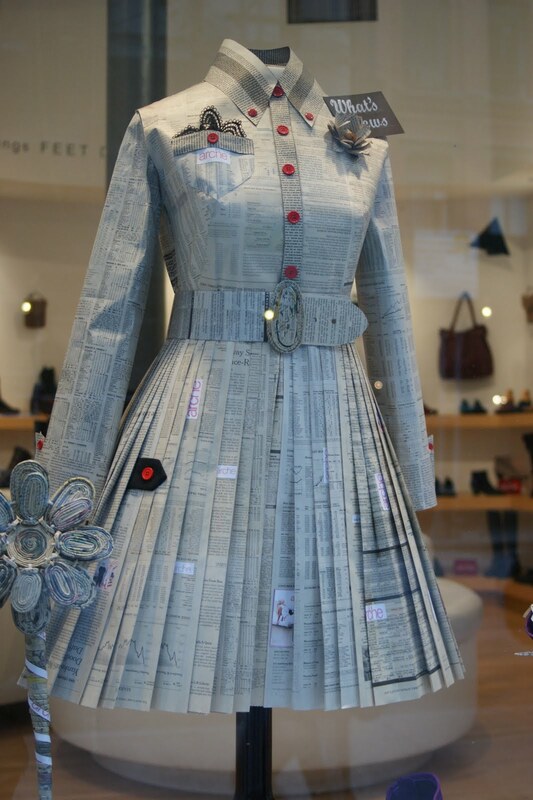 Why not make a lovely pleated dress out of your already-read New York Times like the one here in the Arche shoe shop on Astor Place? I wouldn't suggest wearing this paper and ink creation out on a rainy day unless you tailored a pretty trench coat out of -- lets say -- white garbage bags! Frugal Fun: a Boo-tiful Surprise! Don't you love it when you end up having a rich, inspiring (albeit spooky!) experience that is absolutely free? That's exactly what happened when Veli and I walked by the Ideal Glass gallery in the East Village on Halloween afternoon and noticed an exhibition called "Mad Supper Die-Ning. " Now, how could we not stop. Produced by Ayaka May Plus and Momotoko as a way to show New Yorkers, the event was a ghoulish gathering that served up all kinds of gruesome goodies. These treats gave a hand in luring people inside the affair. And here I am with dessert. I wonder if that was a lady's finger! I've given the warning before, but I'll do it again. As much as we love our thrifting -- our picking up fun knickknacks, our perusing pretty little somethings,and handing over our nickels and dimes for a treasured discovery -- try never to let yourself become a Thriftzilla, a gluttonous thrift hoarder gobbling up all kinds of shiny goodies in its path. It's easy to fall prey to the temptation, especially when we see all kinds of objects that tempt us with their inexpensive prices and vintage charm. Sometimes we feel like grabbing everything laid out in front of us, quite often leaving nothing for the next poor soul just looking for a little thrifty morsel or two. See, I even gave you a picture of what I imagine Thriftzilla looks like just to keep you scared. Sometimes it takes enormous willpower to remain patient -- and stay generous. Save up that thrift good thrift karma, for you never know when you'll need to tap into that extra boost, especially when you find yourself in the situation of discovering an item that seems to have come from a set-- say an odd lamp or a charming piece of furniture -- only to wonder, "Will I ever find my beloved discovery's mate?" Most often, you will -- and it will probably happen when you least expect it and most likely in an unanticipated locale. If you're not a Thriftzilla, patience and persistence will pay off along your thrifty journey to bring you that missing treasure. The Object of My Desire: Friends InStyle! I originally posted a longer version of this story last year, but decided to bring it up again since Gardenhouse Décor has been named one of InStyle's 10 to Watch for 2010! And I do love watching them! Even though we may have never met them face-to-face before, the familiar faces we collect on our thrift and vintage adventures quite often become family once we bring them into our homes and our lives. 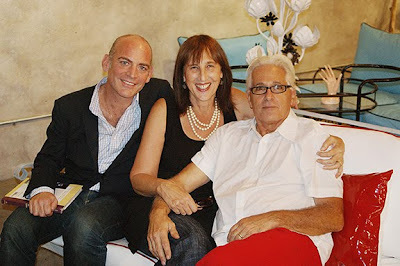 That's how I feel about Cheryl Maeder and Gary Antonio of Gardenhouse who gave a heartfelt welcome last last year in West Palm Beach to The Find: The Housing Works Book of Decorating With Thrift Shop Treasures, Flea Market Objects and Flea Market Objects. Much like the collection of random, thrift oil paintings that Cheryl and Gary have grouped in their home and created a funny family tree of interwoven stories and characters to create relationships, (Can you spot Gary and Cheryl among the portraits?) the gathering of delightful people at Gardenhouse was a testament to Cheryl's welcoming spirit and lovely soul. Just like the portraits that Cheryl so lovingly assembled in her home, I think we look like we've known each other forever, don't you?